"One Sunday afternoon Emil and I were walking in a field when he called my attention to a pigeon circling overhead and casually remarked that the bird was looking for him. He stood perfectly still and in a few moments the bird alighted upon his outstretched arm. He said the bird had a message from his brother in the North. This proved to be a fellow-worker who had not reached the attainment whereby he could communicate directly, so he took this means. We later found that the Masters are able to communicate with each other instantly by thought transference or, as they call it, a force much more subtle than either electricity or wireless. "Every day during this time I had lessons with Emil. He would suddenly appear in my room, even if I had taken special care to lock the door before retiring. At first his appearance at will disturbed me but I soon saw that he took it for granted that I understood. I became accustomed to his ways and left my door open so that he could come and go as he pleased. This confidence seemed to please him. I could not understand all his teachings and I could not accept them fully, nor was I able, with all I saw while in the East, to fully accept at the time. It required years of meditation to bring me the realization of the deep spiritual meaning of these peoples’ lives…. "When occasion requires they walk on water, go through fire [not as a fakir’s “show”, but if fire genuinely threatened – D. Tame], travel in the invisible, and do many other things that we have become accustomed to look upon as miracles performed only by one supposed in some way to possess supernatural powers. "There is a striking resemblance between the life and teaching of Jesus of Nazareth and those of these Masters as exemplified in their daily life. It has been thought impossible for man to derive his daily supply directly from the Universal, to overcome death and to perform the various so-called miracles that Jesus performed while on earth. The Masters prove that these are their daily life. They supply everything needed for their daily wants directly from the Universal…. They have so far overcome death that many of them now living are over five hundred years of age, as was conclusively proved by their records. "There are comparatively few of these Masters in India, other cults seeming to be but offshoots of their teaching. They realise their number is limited and that only a few scholars can come to them. In the invisible, however, they can reach almost unlimited numbers and it seems to be the greater work of their lives to reach out into the invisible and help all who are receptive to their teaching." The first three of a series of six volumes by Spalding render his account of living with and attempting to learn from these Eastern Masters from 1894 to 1898. While very numerous “supernatural” powers were demonstrated by these individuals, they were always much more concerned with rendering their deep spiritual knowledge. For indeed, the powers were mere by-products of their great oneness with the Source of All. Outer phenomenal abilities were considered inconsequential compared to one’s own individual inner spiritual growth. Some of these great Masters had lived for several centuries in the same biological bodies. Others had disappeared from the physical world altogether, having transcended it – yet could reappear from the worlds beyond at any time. Those still in the body and those who had transcended the biological form altogether were all part of the same Brotherhood, those still embodied appearing to be just a little less attained than those beyond the requirement for flesh form. This Brotherhood of Masters (of both genders) were scattered throughout India and beyond, but largely unknown to the masses. They had existed for untold ages and would exist forever. India, of course, is well-known for its wealth of mysticism, and for its many yogis, saints and sages. The Masters described above, however, are of a different degree altogether to most of the publicly-known yogis and saints. Some of the greatest of the yogis and saints of India have known, or at least known something of, this Brotherhood of India’s “other” Masters, but for the most part the Brotherhood went unknown and unsuspected not only to Indians of the late 1800s, but still are very largely unknown and still unsuspected to Indians today. Even many yogis do not know or know of them. And to scholars, including scholars of Vedanta, this Brotherhood of India’s other and deeper Masters tend to be quite unknown. Often the very greatest of the spiritual souls who have lived and taught publicly within India have known of these Masters, but kept their knowledge to themselves. Sometimes these great leading lights were even “envoys” or representatives from the Masters, sent as their disciples to live and serve physically among the masses. But still this Brotherhood of Masters who are in close rapport with each other, and who have either lived for many centuries or else have transcended the physical body altogether, are still unknown to almost everyone within the subcontinent. That situation is now imminently due to change, which is why I am writing this article. It is the intention of this “hidden” Brotherhood of great Masters to now externalise and to interact much more with earnest seekers on the spiritual Path. This Brotherhood of Masters are in fact not limited to India at all, but are global and universal in scope, though India – as well as Nepal, Tibet, China and other Eastern nations – has long been a place wherein many of Them abide. Yet in fact They exist and have Their private retreats, temples and homes on every continent. And Those among Them who have transcended the biological body altogether are of course not limited to any geographical area. Indeed, these Masters have often chosen to make Themselves known to worthy disciples of the West. In August 1930, while hiking on the side of Mount Shasta, California, Guy Ballard, a mining engineer, was approached by a most striking individual who was able to work astonishing miracles as a matter of course, as though all of Nature obeyed His beck and call. Yet these “miracles” were stated by this individual to be but the result of applying the Laws of spiritual science. Moreover such phenomena, while useful, were as nothing in importance as compared to the inner, mystical Teaching on how to be the fullness of God that this individual proceeded to dispense first to Guy Ballard, and then to many others. 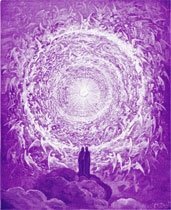 In the years and decades since then, a number of individuals have continued to enjoy association with the Ascended Masters, and literally thousands of pages of the Teachings of these Masters have been published, in addition to thousands of hours of recorded audio Teachings and much that remains unpublished. I believe this stream of Teaching looks set to play a major role in the spiritual, mystical-experiential, “religious” and philosophical flowering of the twenty-first century and beyond. As a reverent, if not expert, student of Vedanta, I am struck at how all Hindus might find the Ascended Master Teachings – and their similarities to Vedanta – of interest. The advent of new dispensations or new approaches to the spiritual Path is a phenomenon well-known to Hindus over time. New light has been shed upon Vedanta regularly, every few centuries. Major new directions in Vedanta have blossomed, or new expositions, such as through Patanjali, Chaitanya, and others. In more recent times, a little over a century ago, Sri Ramakrishna introduced a new paradigm of spiritual approaches, such as all-encompassing non-exclusivity of beliefs, and much more. Likewise his disciple, Vivekananda, was instrumental in facilitating a spiritual renaissance among some of the West by introducing Vedanta there. Devotees of great figures such as these are keenly aware, then, of the importance to the world of the introduction of radically new spiritual ideas, paradigms, and dispensations. The Ascended Masters’ Teachings may be viewed in such a light. This relatively new tradition incorporates a stream of philosophy and practices that, whilst holding to the time-honoured moral guidelines and mystical precepts of any worthy spiritual Path, are also as detailed and as experientially scientific as Vedanta. Indeed, they are comparable to Vedanta in many ways, yet at the same time chart intriguing new territories. In the opinion of many, the particularly new aspects of belief, practice, and personal spiritual experience of these Teachings present a genuinely new paradigm of the spiritual life for both East and West. Since attempts to use precise synonyms between the two traditions can be misleading, with a few exceptions I shall therefore sketch an outline of this tradition in its own terminology. Sri Ramakrishna liked to quote the Bengali saying, “As many faiths, so many paths.” This is similar to the Vedic dictum: "Truth is One. Sages call it by different names." To those possessed of some familiarity with both the Ascended Master Teachings and the Vedas, it is evident time and time again that the same – or very similar – Truth is being spoken of by each tradition, even at times when the subject is quite detailed and technical. It may be that this similarity is not recognised as frequently as it might be simply due to the different terminology used. Hence the idea of briefly introducing the Ascended Masters to those who may be of a Hindu background. The Ascended Masters began Their more overt, public service among humanity in 1875, with the founding of the Theosophical Society. Theosophy was never Buddhist or Hindu per se, but drew upon both Buddhism and Vedanta for the sake of their rich lexicons of spiritual terminology, capable of describing Cosmic Law to a Western world that until then had been broadly ignorant of such matters of deeper spirituality. Theosophy was outwardly founded by Westerners, but was actually prompted and inspired from behind the scenes by Eastern Adepts, and soon came to be based near Madras, India. In retrospect it can now be seen that this was in general a time of great spiritual ferment and renaissance. Sri Aurobindo’s spiritual life and teachings stem from around this time. Ramakrishna lived from 1836 to 1886, but only gathered his disciples around him and had a wider impact upon the Hindu world in the final years of his life. The impact of Ramakrishna’s life became all the greater after his mahasamadhi, when the disciples formed an Order in his name and began their own work. This initiated what is sometimes called neo-Vedanta, touching upon such elements as the aforesaid openness to other faiths, as well as a greater openness in general to the various diverse paths of Vedanta itself, the various yogas, and other streams of spirituality within India. Patriarchal Hinduism was challenged with the exoneration of the female. The monastic Ramakrishna Order was also relatively new in India in its emphasis upon action and charitable work, as opposed to what had at times tended to become a rather too inward-looking, self-oriented form of the spiritual life within India. The latter quarter of the nineteenth century, then, and leading into the early 1900s, saw the beginning of several streams of change and of renaissance of the spiritual life for both East and West. These may be viewed as a foundation and background for the comparatively very different spiritual world we live in today, with the East’s neo-Vedanta and the West’s increased interest in mysticism and the true living of religion, as well as the Ascended Master movements. For those interested in the causes behind effects, or in esoteric history, it truly is noteworthy that the fifty years from 1875 to around 1925 saw not only the coming of Theosophy but also of such change and renewal within Hindu religion and society as the mission of Ramakrishna, the birth of Baha’i, and the work of Sri Aurobindo and others. This partly resulted from the presence in India of the British and of the Empire, which led to a co-mingling of ideas and an East-West interaction that was to profoundly change the spiritual possibilities and philosophical thinking of both cultures. But the Brotherhood of Ascended Masters was also an impelling force behind the renewals. It was within such a time of positive spiritual ferment that the Ascended Masters were able to begin Their own first organisations, such as the Theosophical Society. But this spiritual stream has moved on since then, many more divine truths being released to the world, even for the very first time. The Teachings of the Ascended Masters, which were much more easily brought forth during a previous period of extremely positive spiritual East-West interaction, are again destined to return to India, adding once more to the mystical treasures already long associated with that land. We briefly reviewed at the opening how “Emil”, who became the contact between Baird T. Spalding and the Masters, was not himself Ascended, though he and others nevertheless had been alive in the same bodies for several centuries. It is not so unusual for advanced yogis, through hatha yoga, pranayama, and other techniques, to remain particularly youthful, so as to live long, and even well beyond a hundred years. But in the case of Emil and his brethren an entirely different order of Mastery is evident: in them the ageing process has been halted entirely, and is often reversed. It is typical for the Masters and Lady Masters of this Brotherhood to retain the body for as long as they desire, as great Adepts, then eventually to pass through the process known as the Ascension. After taking Their Ascension, while They can still appear at will, no biological body is retained. The fact that this stage in particular, the stage of the Ascension, is possible – nay, is even the definite and ordained divine destiny – for every man and woman, has never been publicly known in the West (save for the one example of Jesus), and is basically unknown or forgotten within Hinduism also. It is therefore well-worth our focussing upon. We see, then, the great difference of degree between most incarnate yogis and teachers, who are born, may be very illumined, but nevertheless also die as do most of us, and the Ascended Masters. These Masters are not gurus still in incarnation, for They have already transcended biologically-created bodies, hence are said to be Ascended. They are able to appear in tangible solidity at will but for various reasons it is not yet considered wise for Them to appear publicly to the many – though this time will come. Presently, therefore, They train qualified individuals to be what are called “Messengers”, these being spiritually accomplished men and women whom the Ascended Masters can overshadow and speak through publicly – to dozens, hundreds, or many thousands of students. Such Messengership has absolutely nothing in common with spiritualism or what in the West is called “channelling”. One might liken it more to the manner in which Kali Herself seemed to discourse through Ramakrishna. Only Those who are God-Free, Ascended or Cosmic Beings speak through a Messenger, and it is a spiritual, not a lower psychic process. Organisations are formed around such Messengers, and these tend to be called “Activities” of the Ascended Masters since they are not religions or churches in the conventional sense. There have been several such Activities in the last hundred years, as well as associated lesser outlets. The early precursor to them all was the Theosophical Society founded through Helena P. Blavatsky in 1875, though only very few Masters were involved in this, and in fact the most prominent sponsoring Masters, El Morya and Koot Hoomi Lal Singh, were not yet quite Ascended but still in Their final earthly, incarnated forms as Mahatmas. 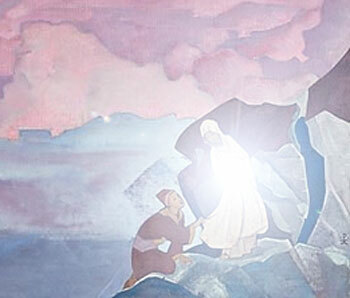 In the 1920s El Morya (by then Ascended) and others formed the Agni Yoga Society in Russia by inspiring and training his disciples Nicholas and Helena Roerich to become Messengers for the Ascended Masters. The Roerichs went on to live much of their later lives in India, Nicholas also becoming world-famous for his wonderful paintings of the Himalayan range and other regions of the East. Through Guy and Edna Ballard was created the “I AM” Activity in the 1930s. Other Activities through which further Teachings were released and more disciples trained were The Bridge to Freedom in the 1950s and, from 1958, The Summit Lighthouse a.k.a. Church Universal and Triumphant. It is presently accepted by many in this tradition that the current Ascended Master Activity through which the Masters’ work is primarily focussed today is The Temple of The Presence. This was formally inaugurated quite recently in 1995, and its present Messengers are Monroe and Carolyn Shearer. While the headquarters are in Tucson, Arizona, its mission is considered to be global in scope. The Teachings of the Ascended Masters share with the Vedas that they are not intended to be taken and accepted on faith alone. Nor are they remotely intended to be a merely intellectual philosophy. Rather, these Teachings are exceptionally focussed upon spiritual practice and all that is practical: they explain what in this tradition is considered to be the true goal of life (the Ascension) in great detail along with the practical techniques for its attainment, and the stages and steps toward it. Ascended Masters, moreover, speak to their students (either directly or through an authorised and initiated Messenger) with an authority, power and clarity that simply cannot be conveyed in words. The Ascension state transcends samadhi alone, for while it incorporates a form of samadhi as a permanent raised state of consciousness, in the Ascension the individual himself or herself has been raised into a higher world or plane of existence, beyond the gross physical. Having transcended mortality, Ascended Masters are accepted within this tradition to be so at-one with God as to be Themselves Godlike, or aspects of the Godhead, and the directors of the forces of Nature. In this most famous of examples, Jesus Ascended completely and bodily. This has led to a certain misunderstanding at times, which the Masters have shed light upon. When an individual has reached such a heightened state of spiritual development that, upon their final incarnation being fulfilled, they may take their Ascension, in many instances the outer, physical body may not be taken up, but there may be the outer appearance of so-called death. In all Ascensions, the jiva or outer self does indeed Ascend and affirm its full unity with the Self or Atman “above”: the auric parts of man and woman that feel emotion, that think thoughts, that have memory, and even the more subtle part of the physical form (known as the etheric double and many other terms) go through the transforming, rising process of the Ascension into full Union with the Higher Self. Only in the more truly exceptional of cases does the visible, gross physical body also Ascend; while in other instances the individual Ascends at the moment of laying down the body or some time later, the tangible form remaining. "Lahiri Mahasaya’s beautiful body, so dear to the devotees, was cremated with solemn householder rites at Manikarnika Ghat by the holy Ganges…. The following day, at ten o’clock in the morning, while I was still in Benares, my room was suffused with a great light. Lo! Before me stood the flesh and blood form of Lahiri Mahasaya. It looked exactly like his old body, except that it appeared younger and more radiant. My divine guru spoke to me. "With a few words of blessing to me, the transcendent master vanished. Wondrous inspiration filed my heart; I was uplifted in Spirit even as were the disciples of Christ and Kabir who beheld their living guru after his physical death." "Here in Calcutta," Panchanon said, "at ten o’clock in the morning that followed his cremation, Lahiri Mahasaya appeared before me in living glory." "As the import of his words dawned on me, I cried out brokenheartedly, believing that I was seeing him only in a vision. "The master approached me comfortingly. ‘Here, touch my flesh,’ he said. ‘I am living, as always. Do not lament; am I not with you forever?’"
The fact of the Ascension as the final and ultimate goal of all our incarnations is one of the most important teachings the Masters wish to convey to us today. Further, they wish to demystify the subject: in accounts such as the Ascensions of Jesus and of Lahiri Mahasaya above, no magical or unique process was involved. Rather, these great figures trod a Path and used certain practices open to us all. This demystifying and assertion of the goal of the Ascension is certainly one prominent feature of the teachings of the Ascended Masters, but there are other new aspects to this new spiritual stream. For example, while this tradition does incorporate an extensive printed body of recorded Teaching, its Teachers are forever and eternally alive, in the Ascended state, in the present, and interact with Their disciples and students in various definite ways in the here and now. Following this Path is never one of having only past scripture and writings to hand: the Masters are forever present, adding and speaking anew, year-in, year-out. A third development new to this tradition is the unparalleled detail and clarity of information released about the nature and activities of the Higher Self (Atman, God Self, I AM Presence) of every man and woman. No longer is this higher Reality of our true Selves a somewhat vague and for-some unknowable Being. The Individualised Mighty I AM Presence is now understood in quite some detail. Our God-Reality is called the “I AM” Presence in these Teachings because it, of its own election and volition, chose to emerge from the Allness of Brahman by the primal, initial act of self-consciousness, the knowledge and affirmation that “I AM”. Here, the “I” is the individualisation, the individual God Self, and the “AM” is that Being’s simultaneous remaining and continuance within the Allness. However it cannot be stressed enough that the God Self of each man and woman is individual. The Atman, or the Jivatman, of Vedanta come close to being synonyms for the I AM Presence, but within the Vedas we find no extensive development upon the theme of how one Atman differs from another. The Mandyuka Upanishad tells us, “Atma Brahma”, or “This Atma is That Brahma”. And so it is. But each Atman or I AM Presence is also an individual, totally unique Self-Conscious Being, possessing form (at its own vibratory level of existence). It possesses a unique “life-history” of millions of years of experience (even before projecting a tiny portion of itself into incarnation, while still within the Anupadaka sphere). And it has its own multitudinous Thoughts and Plans. This individuality is forever: following the Ascension, or true moksha (liberation), there is no loss of individuality as in some utter merging back into Brahman. Disciples within this tradition place their attention as deeply and as frequently as possible upon their own I AM Presence in order to draw down more of its spiritual Light and to manifest more of that Presence within these lower realms. This is a Path of nondualism. We are not separated from the Presence but are a portion of it projected into time and space. In loving and worshipping the Presence, we are but placing our attention upon the Greater and more Real part of ourselves. The Power of the Phrase "I AM"
There is another vital reason why our Higher Self is in this tradition also called the "I AM" Presence. "I AM" is not only a declaration or a self-descriptive statement, but is one of the most powerful of spiritual tools. The understanding, taught by the Masters, is that only individualised, self-aware aspects of God can create. Brahman, as such, does not and cannot create or act directly within the more dense worlds. This, of course, is paralleled in the Vedas. Only when a portion of the One becomes individualised as in the I AM Presence can that individual Presence of God then think, make decisions, act, and thereby create in whatever spheres it projects itself down into. Hence the Universe itself in manifested form was not created by Brahman but by the “I”s willing Themselves to individualise from out of the “AM” or Allness. Think about that. It means that you, the reader, and I, are ourselves in our higher forms the Creators of the Universe. This is why, once we manifest the fullness of what we really are once more, “miracles” are performed – because we ourselves are still, in our true God Selves, the Creator, Preserver and Transformer of all. The importance, then, of the phrase “I AM” is that whatever follows that statement must eventually manifest, according to Divine Law. The phrase “I AM” opens the door for Energy and Substance to manifest according to what follows in thought, feeling and speech. If we say, “I am feeling ill”, then we preserve or worsen that condition. Conversely, students of this tradition use the voice in very carefully constructed (or divinely revealed) mantras, invocations and dynamic rhythmic decrees, often following “I AM” with very positive spiritual affirmations. Just as Sanskrit mantras are considered so sacred, similarly the mantras of the Ascended Master tradition are highly-charged with potency. Also, these mantras and dynamic decrees are given at times with considerable rapidity and firmness of intent (while retaining intense visualisation of that being said, and enunciated with deep love), and can be highly rhythmic. The sacred sound of many people giving them in unison cannot be adequately described, but must be heard. And the powerful spiritual effects of this new technique of how to use the voice on the Path can only truly be understood through one’s own practice. Decrees of this nature are used for one’s own Path, and for the healing of others or even of very large, difficult or distant world conditions. There is sometimes a tendency even for very devoted and highly attained individuals to consider that the Path to union with God, or the Atman, must take place over very many, or at least several, further lifetimes. The Ascended Masters do not teach a Path whereby earnest disciples must gradually evolve and grow into a self-realised person, year after year after year, and perhaps over many lives. The emphasis and techniques focus upon becoming our true divine nature in the here and now. Total liberation (the Ascension) may not, in practice, occur instantaneously upon entering this Path, of course; nevertheless it is a supremely powerful spiritual tool to accept a qualitative focus (“I AM and can know and manifest God now”), rather than a quantitative focus (“little by little, over time, I believe I will eventually get there lifetimes from now, but not yet”). Quite frankly, the latter mode is prone to be over-emphasised by some who follow Vedanta, as well as by most within the Western New Age movement. And clearly, which of these two self-concepts we accept regarding our true potential will exert an enormous influence upon the rate of our progress Godward. Although some aspects of the Teachings of the Ascended Masters have been present in varying degrees in the world’s religions, the deeper knowledge was not present. The understanding of this tradition is that prior to the twentieth century humanity had always been under the “occult dispensation” whereby certain deep and key teachings could not be released publicly to the world. They could only be conveyed in privacy to a few worthy, selected disciples. But since the 1930s, Saint Germain and many other Ascended Masters have been enabled to release new revelations publicly for the first time. Absolutely key among these unveiled mysteries is the use of the Violet Transmuting Flame. By the invocation of this spiritual Flame it is possible to transmute and dissolve karma, by a spiritually scientific method, very much more quickly than karma is balanced by either its natural, eventual return or by the active doing of good deeds (though good deeds are certainly still engaged in by the students). Karma, fundamentally, is misqualified energy-substance, and can be tackled as energy or substance by means of “spiritual physics”. Indeed, the inner science of what karma is and how it is balanced or transmuted is described in much detail at the level of an extremely subtle level of “particles” or energy. Since the release of this Teaching in the 1930s, students of the Masters believe they have experienced that the Path to total liberation can now be greatly accelerated. Put succinctly, the Violet Flame dissolves karma – potentially very swiftly. This alone, the use of the Violet Transmuting Flame, is considered to be a tremendous revolution within the realm of the world’s spiritual techniques. It is absolutely accurate to say that in addition to the yogas known and espoused by Patanjali, the invocation of the Violet Flame consists of an entirely new yoga for the present age: Agni Yoga (“Fire Union”, or Divine Union by use of the Sacred Fire). To revisit the subject of samadhi for a moment. Within Vedanta several different states or heights of samadhi are sometimes described, but in general it means the attaining, either spontaneously or at will, of a state of consciousness of extreme, ecstatic spiritual bliss. In its “lower” forms the person may still be walking around and functioning to some degree in the physical world, but typically experiencing everything around him/herself as being flooded with divine Light, and perceiving divine reality behind all outer appearances. In higher states, the body may be immobile and the consciousness later reported to have lost much or all sense of having or being an individual, personal self. Such classic samadhi experiences reflect the Vedas in that the person believes there has been an episode of complete unity with ultimate Reality. This ultimate Reality is frequently experienced and reported in terms of omniscience, loss of “self”, a merging into the Oneness of the Godhead, transcendent bliss and love. Within the various particular spiritual paths of Hinduism and the schools of yoga, the attainment of samadhi is commonly believed to be the goal and purpose of life. Moksha (liberation), and freedom from the rounds of rebirth, is also quoted as the ultimate goal of life, but this is often confused with samadhi: the implication is often there that one who has attained to the higher form of samadhi is by definition 100 per cent free and liberated. In the light of the Ascended Masters’ Teachings, certain age-old concepts here frankly are not far from the truth, but require subtle amendment. Samadhi per se, even in its higher forms, may be wonderful to achieve, and may illumine a person’s consciousness and life ever thereafter, but it is not in fact the absolute and final goal of life. Just as one may become “stuck” or trapped on the spiritual path by becoming over-enamoured with siddhis (psychic powers), so too even samadhi can become a sticking point along the Way – if one attains it and then stops there, believing that all the purposes of life are now completed and fulfilled when in fact they are not. Within Buddhism we have the example of Gautama who, having attained such a high level of consciousness, chose not to remain within it but to “return” to the physical world in order to act, teach and serve for the sake of the rest of humanity. There are innumerable examples of people who have attained samadhi, yet afterwards have frankly not become glowing examples of perfection or of the spiritual path. Nor does samadhi necessarily free a person from the possibility of retaining error in their thoughts and beliefs, which they may even convey on to others. Even in the West, with the increasing interest in spiritual matters and techniques, many people have achieved genuine samadhi at some level, yet have afterwards returned to relatively normal lives. Following samadhi, one is still incarnate within a physical body, one can still make mistakes and one can still create karma. Samadhi is a state of consciousness, resulting in large part from the raising of kundalini. However, the attaining of any particular state of consciousness is not, alone, the ultimate goal of life, albeit it may obviously be a good signpost that one is on the right track. It is entirely possible, and in fact occurs more frequently than not, that an individual attains samadhi but is still reborn in a next life. In that next lifetime samadhi may once more be attained, but still another incarnation may follow, and so forth. Why is this? Because one prime essential requirement for the real goal of life, the Ascension, is to have balanced a majority of one’s karma. And sometimes samadhi is attained, kundalini is raised, bliss is felt, and spirituality is displayed while a majority of one’s karma yet remains untransmuted: therefore one is compelled to incarnate again by Cosmic Law, until the karma is balanced. Given that higher states such as samadhi are blissful, it is easy to become content with such achievement, and even to become convinced by such insightful and blissful states that one has indeed overcome the world and balanced one’s karma when this regrettably may not be so. More than just the “feeling” of liberation, true liberation is a real and active process. There are several further requirements for the Ascension, of which we shall mention one more. The fire-spark of the Atman within the heart chakra (anahata chakram), as described in Vedic texts, consists in fact of a triple plume, each plume of spiritual energy having a different quality. The three plumes of this Threefold Flame are the energies of the Atman or God Presence anchored within us as Will, Wisdom and Love. The three plumes also correspond to the sacred energies of Brahma, Vishnu and Shiva, respectively. In the great majority of people there is an imbalance between these three as the person, over many lifetimes, has cultivated and manifested them. Thus an individual may excel exceedingly in Divine Love, but comparatively lack illumination or Wisdom, and determination, power and Will. Or there may be much attainment in Will and also in Love, but a lack of Wisdom as to how to correctly utilise these divine gifts. While such an imbalance exists, the greater and more expanded plumes are held back by the less developed, and only when the three are in balance can certain activities next begin to unfold within one’s being which set the three plumes spinning within the heart chakra and take one nearer to the Ascension. Many who rely upon meditation alone for their spiritual path may attain samadhi but will not necessarily have a balanced Threefold Flame. Perhaps they excel in Will and in Wisdom, but lack compassion and divine Love – the degree of compassion that would compel them to get up from their meditation and stride out to serve other parts of life. 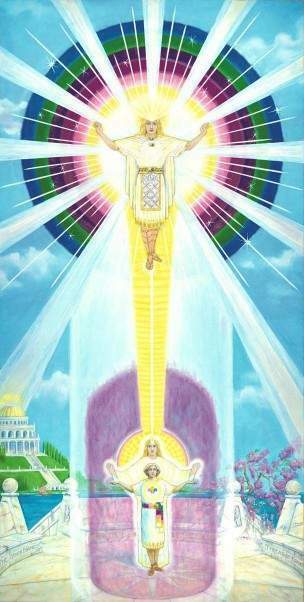 I was once present when a disciple asked the beloved Master Morya (through a Messenger), “Beloved El Morya, is it not possible to attain the Ascension simply through meditation?” Morya responded with a speed that was quite humourous: “It depends how long you want to take!” Then He proceeded to explain how meditation does relatively little to balance karma. In order to achieve the essential balancing of karma, the use of the Spoken Word in dynamic decrees, especially to invoke the Violet Transmuting Flame, is essential, as are good works or karma yoga. The rishis responsible for the writing of the Vedas had obviously experienced samadhi, and display great wisdom in their works. Yet we do not find at that time-period a full knowledge of the wonderful individuality of every Atman, each differing from another. (The fact that each Atman or I AM Presence is so individual and distinct is evident from their projected incarnations – ourselves! Among six billion people alive on earth, not one is precisely the same.) Our True Being, the Atman or God Presence that we are in Reality, stepped forth from out of Brahman long ago to bestow its individual gifts and graces upon the rest of life, and to expand its own capacity to Create for the greater glory and expansion of the Divine. In Ascending, man and woman become one with this Higher Self, and are that individual God Presence literally forevermore. Confronted with such beliefs, if only subtly expressed, one might almost feel reluctant to spiritually succeed! Why achieve liberation if it actually leads to the loss of self – even the loss of that which is pure and holy within us, but is nevertheless self-aware and individual? It is very frequently the case that when incarnate and unascended human beings experience samadhi, there is a loss of individual awareness in the normal sense, and there is felt to be a merging into the Oneness of the Divinity. This Oneness and constant communion does exist between all Ascended Masters in the Ascended Master Spheres of existence, but individuality is also experienced by Them simultaneously. In merging with the glorious Mighty I AM Presence, individuality as that individual Presence is the “I” aspect of the beingness of the I AM. But frequently it is the case that unascended humans in samadhi only know the “AM” aspect of this I AM beingness – the communion with all of the Universal Godhead. Thus, the ancient authors of the Vedas were correct so far as they went in describing the union with the Atman. Yet the retention of individuality in that state may not have been experienced by them. Or at least they did not clearly write of it. Yet in truth, individuality is forever retained as we expand God-Consciousness within ourselves as Beings ever-growing in spirituality after our Ascension. This is one essential new fact the Ascended Masters now seek to make quite clear to humanity. Such beliefs as whether, once freed from the rounds of rebirth, individuality as a God Being is retained or not, may be subtle at times, but they are also extremely important. Whatever a society believes to be the end-goal and ultimate purpose of life undoubtedly plays itself out within that society and civilisation, colouring and shaping its religious, cultural and even political structures at their core. Any fundamental religious faith held in common results in its own variety of governance and of civilisation. For it shapes what people actually strive to do and to become (or not do and not become!) during the span of their lives. I would humbly suggest that we do see in India and its history, amid all the undoubted glory of its spiritual heritage that is such a gift to the world, a lack, relative to other civilisations and relative to India’s own real potential, when it comes to the organisation and putting into practice of mastery over the physical world and environment. Meantime, certain errors within Christian doctrine and dogma such as the concept that we are “saved” by Jesus and do not save ourselves, along with the lack of knowledge within Christianity of karma and its need to be balanced, also hold individuals back from the very concept of pursuing a path of total self-mastery. This is a complex issue, difficult to discuss with broad brush-strokes. But I would suggest that part of India’s past history and nature, relative to the land’s real and limitless potential, is due to such factors as an overemphasis upon going within, as in meditation and solitary asceticism. This overemphasis was sometimes found among those who have been India’s most spiritually-advanced individuals, and who might therefore often have provided the greatest leadership through the centuries. Yet solitary wandering, asceticism and austerities have sometimes been chosen over what might have been national leadership unto a glorious renaissance. Secondly, despite any amount of austerities, there has also been, hanging over the land, the fact that karma was in fact remaining unbalanced. The solitary path of individual attainment, with the goal as samadhi, was overemphasised, whereas group spiritual work combined with more focus upon the tangible world we live in can bestow benefits, including spiritual benefits and blessings, literally upon the millions. There is even such a thing as conglomerate or group and national karma, and so we have seen in India and other nations the outpicturing, century after century, of terrible floods, of earthquake and of famine despite the sincere attempts of so many millions to become one with God. Such manifestations are by definition group karma, indicating that karma is retained, awaiting its transmutation or balancing. Nothing could balance this karma more swiftly and completely in India than the regular invoking of the Violet Flame, first by the few and then by the many. The Violet Flame transmutes by spiritual science not only personal but also group and national karma. A wonderful account of the Ascension of one comparatively recent Indian sage is that of Sri Yukteswar, the guru of Paramahansa Yogananda. One can hardly think of a more apt example than this in order to demonstrate how the Ascension is not only a very natural process as the end-result of our spiritual progress upon earth, but also that we definitely retain our total individuality – as much as we have it now, and more so! - once we are fully liberated beings. In his famous autobiography, Yogananda tells of his deep sadness upon the passing of his guru in March, 1936. Upon hearing of his Master’s illness, Yogananda did not reach him at Puri before the end: “while the train roared toward Puri, a vision of Sri Yukteswar appeared before me. He was sitting, very grave of countenance, with a light on each side.
" ‘Is it all over?’ I lifted my arms beseechingly. "He nodded, then slowly vanished." "Sitting on my bed in the Bombay hotel at three o’clock in the afternoon of June 19, 1936…. I was roused from my meditation by a beatific light. Before my open and astonished eyes, the whole room was transformed into a strange world, the sunlight transmuted into supernal splendor. "Waves of rapture engulfed me as I beheld the flesh and blood form of Sri Yukteswar!
" ‘My son!’ Master spoke tenderly, on his face an angel-bewitching smile. "For the first time in my life I did not kneel at his feet in greeting, but instantly advanced to gather him hungrily in my arms. Moment of moments! The anguish of past months was toll I counted weightless against the torrential bliss now descending.”"
After some dialogue, Yogananda asked: "But is it you, Master, the same Lion of God? Are you wearing a body like the one I buried beneath the cruel Puri sands?" " ‘Only a little!’ I had been embracing him with an octopus grip. I could detect the same faint, fragrant, natural odor which had been characteristic of his body before. The thrilling touch of his divine flesh still persists around the inner sides of my arms and in my palms whenever I recall those glorious hours." Sri Yukteswar remained with Yogananda in his Bombay hotel room for two hours, during which he answered his every question. Within Yogananda’s autobiography, these words from the Ascended state by Sri Yukteswar are a teaching in themselves, taking up a whole chapter of some 23 pages. Hardly a vision or an illusion – this! The Master went on to explain his own continuing role in his Resurrected or Ascended state. His own new and higher service was now to act as teacher and saviour on an astral planet. This planet was beyond the physical plane, and also much higher in vibration than the vast majority of the astral plane. It was still a world of subtle limitation, however. Those reincarnating upon it, and whom the Master now taught, were free of earthly and physical karma, but not yet free of astral (emotional) karma and therefore still not wholly liberated. Sri Yukteswar explained, "When a soul finally gets out of the three jars of bodily delusions [the physical body and its karma, the astral body and its karma, and what the guru called the causal body – D. Tame], it becomes one with the Infinite without any loss of individuality. Christ had won this final freedom even before he was born as Jesus. In three stages of his past, symbolized in his earth-life as the three days of his experience of death and resurrection, he had attained the power to fully arise in Spirit." "Angelic Guru,” Yogananda said, “your body looks exactly as it did when last I wept over it in the Puri ashram." "O yes, my new body is a perfect copy of the old one. I materialize or dematerialize this form any time at will, much more frequently than I did while on earth. By quick dematerialization, I now travel instantly by light express from planet to planet or, indeed, from astral to causal or to physical cosmos.” The divine guru smiled. “Though you move about so fast these days, I had no difficulty in finding you at Bombay!" "O Master, I was grieving so deeply about your death!" The goal of life as taught by the Ascended Masters is, then, the Ascension. This is not really the same thing as moksha or mukti (liberation) as usually thought of, or jivenmukti (liberation while alive). Closer to being synonyms for the Ascension are Videka-mukti (disembodied release) or sudyomukti (immediate release). These too are not precise synonyms, however, since in practice, these concepts may not today always rise in peoples’ understanding to the fullness or grandeur of their real, original meaning. In Vedantic literature the terms siddha (perfected being) and paramukta (“supremely free” – full power over death) may be taken as meaning the same as Ascension or Ascended. A paramukta has completely escaped from the mayic thraldom and its reincarnational round. A paramukta therefore seldom returns to a physical body. If he does, he is an avatar. The “problem” is that while siddha and paramukta may indeed technically mean the same basic state of being as Ascended, the full understanding of what it means to be truly completely liberated or Ascended has largely been lost in India and in other parts of the world today. "Suddenly, like a flash of lightning, a Circle of the most intense, dazzling, white Light surrounded us, drawing steadily [inward] … until it was only about ten feet across. The Light within Daniel Rayborn expanded, and met the Circle of Light without. As they touched, he began to rise slowly, to a distance of about his own height … the Light within him continuing to increase. Once thus Ascended, such liberated Beings may choose to move on from Earth into Cosmic Service, or may remain as part of the inner, spiritual Hierarchy which guides, guards, and wherever possible intercedes on behalf of humanity. Moreover, life is not static in the Ascended state! The spiritual Path continues, and yet other, further spiritual heights beckon, one after another, so that to Ascend is in some respects but the beginning of a greater and more expansive spiritual Path of growth and of service. At a certain point of attainment, such Masters become so glorified, and possess such selfless Mastery over Mighty Forces of Nature, that They are veritable Gods, and are called "Cosmic Beings". Should such a Being decide to manifest Himself or Herself to an unascended individual upon Earth, in Hindu terms that One would appear to the human to be indeed a god, a deva, or a deity, the human often little suspecting that this God Being was once also incarnated as man or woman, and once also knew all the woes, tests and trials of physical existence. Those Ascended Masters Who remain to serve the Earth and its inhabitants may have Ascended a few years, or untold millennia ago; they may be well-known historical figures or may be quite unknown to humanity at large. Such men and women, our Elder Brothers and Sisters on the Path Homeward, have Ascended from both East and West, and from every major religious tradition as well as from spiritual traditions no longer known or recalled today. It is highly likely that the ancient authors of the Vedas also Ascended at some time past, after composing the Vedas, and are Ascended Masters today. It is considered to be this inner, spiritual Hierarchy of the Earth Who plan and decide upon all new religions that should come into the Earth, and Who prepare, train, and send forth all avatars. The Ascended Ones are the Gurus of the gurus of any visible, biologically born, and publicly known genuine guru. That is, if we trace any authentic chain of gurus and disciples “upward”, were we able to trace far enough we would inevitably discover an Ascended Master at the “top” – though He or She too would then have a Hierarch also, and so forth. This is not, then, only a Western path in the least, nor only an Eastern path. Every genuine Guru-disciple chain, in any nation, religion or clime, stems from the Ascended Ones at the highest point, in one way or another. The real import, then, of Ascended Master Teachings, is that these are not the teachings of unascended mortals, including gurus, who, no matter how spiritually attained, may yet be prone to some karma as well as their own erroneous preconceptions. Rather, these Teachings are the word-for-word releases of Those Who have already proven the Way fully and completely. United with the Godhead as They are, this means that in Their speaking to us, we are being taught quite literally by Perfected God-Free Beings Who are pure manifestations of Their I AM Presences or Atmans. Unshackled by any worldly limitations, Ascended Masters are the very embodiments of Omniscience. Given the opportunity, such as now exists, to learn from such a glorious source, would we accept anything less? I find full confirmation of Ascended Master Teachings in the wonderful heritage of Vedanta, and likewise find confirmation – with intriguing further new elaboration and clarification – of Vedanta in Ascended Master Teachings. The two are so very similar at their cores, frequently approaching the same Truths but simply with different terms and from different angles. As the present century unfolds, these two traditions and their followers are likely to discover much common ground and a warm mutual respect. The more the followers of one tradition learn about the other, the more the similarities become clear. Though the Vedas are ancient and are the foundation upon which most of Hinduism is based, directly or indirectly, there have been numerous additions and necessary spiritual revolutions over time. For example, the organisation of multifaceted strands of yoga into distinct systems by Patanjali at around 1,000 BC, the emphasis upon discrimination and jnana yoga (union through knowledge) by Sri Shankaracharya in the 7(th) - 8(th) centuries AD, Sri Chaitanya’s sweeping away of Vedic nihilism with bhakti yoga (union through devotion) in the 14th century, and the many developments following on from the lives of Sri Ramakrishna, Vivekananda, Sri Aurobindo and other sages, with their pluralism, their communities and karma yoga. Though the Vedas stand for all time, Vedanta itself has never stood still. From this perspective, it might truly be said that the Teachings of the Ascended Masters are not a separate, alternative body of spiritual thought to Vedanta at all. They are, rather, its very latest and most resplendent form. 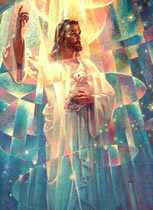 The Ascended Masters are the Ascended ones of both East and West. Indeed many of Their most significant final embodiments were in India, and many of Their present Retreats (hidden sanctuaries and temples located even in the physical world) are in India and elsewhere in the Orient. The land of India has always been a glorious one in its spiritual heritage; and as that glory rises and shines forth to the world once again, the new Agni Yoga of these wonderful Ascended Masters, through the use of the Violet Fire, is surely destined to play a very major role. Here, the lower figure depicts the outer self. Behind or superimposed upon this self is that part of ourselves which engages in no imperfection, being the Christ or Krishna Consciousness. The topmost figure is the Electronic Body or actual form or “body” of the I AM Presence, vibrating at a frequency far beyond that of the outer world, The lower figure – being our physical form, our emotions, our mind and memories - is here depicted surrounded by the Violet Flame as this is invoked to transmute past karmic conditions. In the late twentieth century, some came to believe that “Emil” was in fact the Tibetan Mahatma known in Theosophical and later literature as Djwal Kul (there are various spellings of the phonetic name, and He was probably not quite a Master or Mahatma until the twentieth century). Godfré Ray King, Unveiled Mysteries, Saint Germain Press, Illinois, USA, 1934.